9 hole golf course, snacks, bar, open daily. Open daily, April – October. 18 hole par 70 course. Pro shop, resident pro, carts, bar, lounge, dining room, putting green. Donald Ross course, par 70, 18 holes. The area’s newest course in the shadow of the High Peaks, beautiful! Two hour scenic train ride from North Creek to Saratoga. On board fine dining, spectacular scenery, historic narrative. Bicycles permitted on board. The train features vintage railroad cars as well as double decked sightseeing cars. Two-hour scenic three lake boat cruise aboard the classic 1916 vintage launches Neenykin and Osprey. Spectacular scenery, historic narrative. 11AM, 2PM, Cocktail Cruise 6:20PM (byob) Also boat rentals, sail boats, canoes. Cruise aboard the WW Durant on beautiful Raquette Lake, The Adirondack’s largest natural lake. Lunch and dinner cruises daily, scenic cruises and moonlight cruises. 1 ½ – 3 hours. Historic narration, elegant turn of the century decor, two spacious decks, licensed bar. Memorial Day – Columbus Day Weekend. Cruise on the queen of Adirondack lakes – Lake George. One hour to all day cruises aboard The Mine-Ha- Ha, The Mohican, and The Lac Du Saint Sacrement. Since 1817, enclosed and open decks, snack bars, cocktail lounge, and restrooms. Memorial Day – Columbus Day weekend. Open daily, Memorial Day – mid October 9:30AM – 5:30PM. 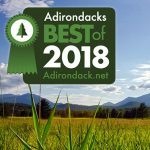 World famous museum with extensive exhibits on the history, people, places, and activities of the Adirondacks. See our calendar of other events at the museum. A must see! Rt. 28, Blue Mt. Lake, NY (518) 352-7715. Concerts, plays, photo and art exhibits and more. For information write ALCA@telenet.net. Rt. 74, 18 miles east of I87 Exit 28, Ticonderoga, NY (518) 585-2821. Revolutionary War Fort at the head of Lake George and Lake Champlain. Restaurant, museum, picnic area. Guided tours w/musket demonstration daily, July – August. Special events all summer. Open daily. Guided tours on the hour, special events. 10AM – 5PM, Summer hours 9AM – 10PM. 101 Newcomb Rt. 28N, Newcomb, NY (518) 582-2000 Open daily 9AM – 5PM, closed Thanksgiving & Christmas Day. Nature trails, slide show, exhibits, interpretive programs, great things for kids. Call 518-582-2000 for a schedule. We have many ways and many reasons to make you smile. Let’s start with 120 of some of the most beautiful lakes, ponds, rivers and streams on this planet…really! The area’s largest fun park. Rides and shows including the Comet rollercoaster, and Steamin’ Demon, and the Black Cobra. 100 Rides, shows and attractions, picnic area. Open daily with extended evening hours in Summer. Call for pricing and operating hours. Barton Mines Road, North River, NY (518) 251-2706. Guided tours and extensive mineral/gift shop. Open daily Late June – Labor Day weekend, Mon – Sat 9:30AM – 5PM, Sun. 11AM – 5PM. Gem cutting demonstrations on Sunday and Monday. The only cave attraction in the Adirondacks. Caves, grottos, waterfalls. Explore, fish, picnic, Rock Shop. Bring your camera! Late May – early Oct., daily 9AM – 7PM, 10-6 after Labor Day.